Beet is a much discussed vegetable. You either love it or hate it, but few are indifferent. Personally, I love beets. Their deeply red color always cheers me up, and the earty taste is quite amazing. 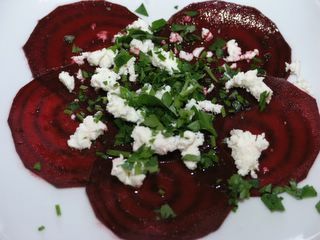 I especially love fresh beets, either simply baked or boiled with a little butter or maybe some crumbled goat's cheese. I make a mean beet risotto, too. When I had friends over for dinner a few nights ago, I was dying to try something different. So I made a very simple carpaccio from thinly sliced beets (Very thinly! Use a mandolin!) topped with olive oil, crumbled feta cheese and some sprinkled parsley and basil. It was, as you can see, very decorative, and it tasted great too. It was, however, a little difficult to eat! You can't really use a knife since the slices are so thin, and you don't want to use your fingertips to eat beets. I found the best way was to gently ease the slices, one at a time, between the prongs of the fork. If you deal with this relatively small problem you'll be rewarded by a delicious mix of crunchy, silky and creamy, tangy, salty and earthy. Oh, and as always with beets... don't be scared when you go to the bathroom. Really a terrific photo of the beet carpaccio. Beet carpaccio, chat a great idea ! Looks great too. I used a simple cheese slicer and it was perfect!